In the past, Logitech has made a number of decent-quality high definition webcams for day-to-day use, such as the Logitech HD Webcam C510. Whilst things have quietened down on the consumer webcam front - with most people using the perfectly adequate webcams that are built into their laptops, tablets and smartphones to Skype and VOiP, Logitech have brought out a new HD webcam specifically for business use. The relatively high price and no frills design highlight that this is a business-focused product, with the straight-talking box the camera is shipped in proudly claiming that it is optimised for Microsoft Lync - a video conferencing service that pretty much no one outside of a boardroom would ever use. The business focus isn't just superficial, however, with excellent audio quality and noise cancellation technology that picked up our voices even in a noisy office. Coupled with a wide-angled field of view which allows viewers on the other side of a video conference to see everyone in a meeting room or around a table, the Logitech Webcam C930e proves itself to be a fine choice for meetings. Image quality is very good, and with high-definition streams recorded at 30 frames per second, the video is clean and free from juddering and other distracting annoyances. 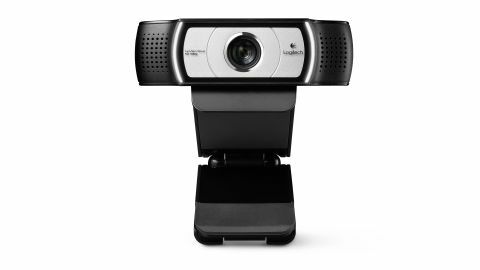 Logitech's experience with home webcams hasn't been forgotten, however, as although this is a professional webcam, it takes no time at all to install and adjust. It's completely plug-and-play on PCs and Macs, and doesn't require any drivers to install, which is handy when you need to quickly set up a video call and don't want to bother your IT department. The stand it comes with is easy to attach and adjust, so you can quickly ensure you get the best view possible. There's no options to zoom or pan optically, so you're stuck with doing so digitally, which means there's a hit to image quality, which is a shame. A nice touch is that there is a privacy shutter that can be attached when you're not using the webcam, to give you additional privacy and protection. The Logitech Webcam C930e is an excellent business webcam with very good image quality and excellent noise cancellation, which makes it a great choice for noisy environments. It is expensive, however, so if you just want a camera for one-on-one video calls or chatting with friends, we recommend going for a cheaper consumer model.